One of my favorite folk singers was "Rambling" Jack Elliot. I had all his albums, learned many of his songs and even had him autograph a guitar once. Now there's "rambling" in terms of going somewhere and there's rambling in terms of talking and just going on and on, not really having anything important to say, but just saying it. This blog is the second kind. Hi Friends - here are places you must be, people you must see and events you must participate in!! Thursday, May 1 - Continued Shared-Reading Diagogue at 10:00 am @ Temple Emanuel - "Abraham's Curse: The Roots of Violence in Judaism, Christianity, and Islam" by Bard Prof and Rev. Bruce Chilton. Everytime we read in this book we learn something that challenges us to think - and then think again! Saturday, May 3 - Cantor Bob Cohen (that's me) and Sabrina Ferguson Bax will give a concert of Songs from Around the World (including Armenian, Russian, Ladino, Yiddish, English, Spanish, Serb-Croation-Macedonian, as well as two contemporary settings of poems by Edward Lear) - at ALTERNATIVE BOOKS, 35 North Front Street in Kingston from 5:30 p.m. to 7:00 p.m. - Free - and those of you who heard us sing at the ASK Gallery know what a beautiful voice Sabrina has. The tel. # at Alternative Books is 331-5439. There is a grand piana there, and I will bring accordion, 12 String Guitar, and Autoharp. Sunday, May 4 - The Israel 60th Birthday Celebration will start at 1:00pm and go til 5:00pm. The Temple Emanuel Simcha Singers & Players (TESSiP) will sing from 2:15 to 3:00pm - we are a combination of young folks with lovely and extraordinary voices, as well as instrumentalists, and grownups including our beloved Rabbi Jonathan Eichhorn, Bruce Berky, and David Winograd. MUZ619 Traditional Music of the Catskills and Hudson River Valley NEW! Cost $60. (4 sessions) This course will cover traditional regional and historic music of the Catskills and Hudson Valley. No musical experience is required, but experienced musicians and singers will have a chance to increase their repertore with "Home Grown" music from our area. We will study the major local collections of music including area colonial songs from the Allison family, songs of Henry Backus "The Saugerties Bard" from the 1850's and songs and dances from Camp Woodland in the 1950's. Examples will include songs of the quarrymen, lumberjack's, steamboat captains, and apple growers., We will also include 20th Century songs by folksong writers such as Grant Rogers, Les Rice, William Geckle, Ken Gonyea, Mark Fried, Rick Nestler and Pete Seeger. Monday nights. Call (845) 246-0900 for more info. Peter T. -- and all you other 'Catters who want to learn some Ancient Folk History. Yup, Charlie's story is true. I was married to Joe Hickerson for many years, and he has been fond of telling the story of how the cyclical "Where Have All the Flowers Gone" came to be. Chapter 1: Joe learned the abbreviated song from Pete Seeger when Pete came to Oberlin College to do a concert in 1954 (or maybe '55). The verses Pete sang were written by Pete, who adapted them from a Russian poem that was printed as the epigraph in a book called "And Quiet Flows the Don." Chapter 2: Joe then went to be a folk-music counselor at Camp Woodland in the NY Catskills the summer after learning the song. He sang "Flowers" to the kids, who loved it. To make the song last longer, he added verses to complete the circle. Chapter 3: Pete Seeger came to Camp Woodland that summer, heard the kids singing his song -- with new verses by Joe -- and loved it. He re-copyrighted the song with Joe as co-author. Chapter 4: The Kingston Trio was the first big pop group to record the longer version of "Flowers." PP&M came a little later, and hordes of other recordings. SAN FRANCISCO  It may be the ultimate collection of paraphernalia of a band known for its fondness of paraphernalia, legal and otherwise. The Grateful Dead, whose songs celebrated personal freedom, American idealism and mind-altering drugs, will donate a cache of their papers, posters and props on Thursday to the University of California, Santa Cruz, which plans to use the musical miscellany as part of a research center to be known as Dead Central. What exactly is to be donated, of course, is something of a mystery even to band insiders. "It's kind of a surprise box to us as well," said John Perry Barlow, one of the group's lyricists. "We'll get to find out what's in there as well." University archivists say the collection was drawn from the band's various studios and business offices and dates back to the Dead's founding in 1965. Among the items are rare photographs, press clippings, stage props, vintage posters, backstage passes and set and guest lists for some of the band's innumerable concerts, which were famed for their lengthy jams and die-hard tape-swapping followers, the Deadheads. The head of special collections and archives at the university, Christine Bunting, said much of the material to be unveiled Thursday at the Fillmore, the San Francisco rock club, was in fact sent to the band from Deadheads, including band-inspired artwork and personal letters. "And lots of, you know, poems," Ms. Bunting added. Unfortunately for fans, the collection includes no new music from the group, which formally disbanded after the death of the guitarist and singer Jerry Garcia in 1995, though some members have continued to play together occasionally. Ms. Bunting said much of the material, which covers about 2,000 square feet, had been in a warehouse at an undisclosed location in Northern California, but would be open to the public in a renovated room at the university's library. While the band inspired no end of drug paraphernalia, Ms. Bunting said none was in the collection. The university, located in a hippie-friendly city 75 miles south of San Francisco, already teaches a popular undergraduate course about the Grateful Dead's music, and is known as "a hotbed of current Deadhead culture," said Bob Weir, the group's rhythm guitarist. Mr. Weir said the band had decided to donate the memorabilia in part to keep it from getting lost as years went by. "It seemed to all of us that the stuff really belongs to the community that supported us for all those years," he said. "And Santa Cruz seemed the coziest possible home for it." You don't have to be a piper to enjoy this weekend. Wonderful place just to drop by and jam. The dates this year are April 25-28, 2008. The prices will be the same as last year and are as follows: Friday dinner thru Monday brunch: $210.00 (room and board) Friday dinner thru Sunday brunch: $140.00 (room and board) Individual meals (if you don't want: Breakfast $3, Lunch $4 and dinner $10. If you just want to come and enjoy the music and you aren't interested in staying the night or having a meal with us and maybe jam along the cost is always: FREE. The site will once again be at St. Joseph's Villa/Falling Waters, 43 Spaulding Lane, Saugerties, NY 12477. If you're interested in attending the weekend please forward a $25.00 non-refundable deposit check (US funds) made out to myself: Ernie Shultis. My mailing address is 4055 Rt. 32, Saugerties, NY 12477. I can be reached via e-mail: cmcpiper@gmail.com or phone (518) 678-3375. We welcome Northumbrian smallpipes, Scottish smallpipes, Uilleann pipes, Cornish pipes, and what ever other pipes you may have lurking around. In the past participants have brought harp, fiddle, mandolin, tin whistle, concertina, guitar, bodhran, dulcimer, didgeridoo, ukulele, etc. So stay warm this winter with thoughts of Saugerties! I'll be teaching a course in Historic Music of the Catskills and Hudson Valley at the Dutchess County Community College Music School - 4 Wednesday evenings in May starting 5/7/08. If you are interested leave a message at 338-8587 or e-mail me at boblusk@hvc.rr.com and I will send you particulars. As Spring is bursting at the seams, here comes Beltane! This Saturday, April 26 (Rain date: Sunday April 27th). no charge for children under 12. $10 for 2 or more people. will be singing a short set early in the program (around 2:00 pm) after joining in with some other folks. Annie and Carrie will also be a part of the Pageant. We hope you can come enjoy this wonderful community tradition! 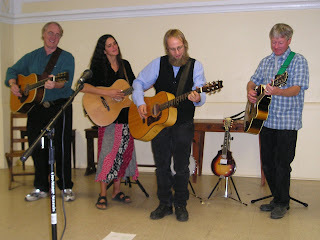 It was about the most fun I've ever had singing "Abe Sammon's Applejack with Ira & Laurie McIntosh and Jim Donnelly at the Heritage Music Concert in Saugerties on Sunday. Here's Ira taking a lead break! Some of you may know that I will be hosting a house concert at my home at 27 Meyer Avenue, Poughkeepsie, on Saturday, May 10 starting at 7:30 p.m. The featured performer is Ben Tousley. Ben Tousley is that rare breed of singer-songwriter who brings together the personal, spiritual and political in concerts that engage and delight his audiences. A veteran of the Boston folk community, Ben has toured widely since 1981 along the East Coast, in the Midwest and South and in England and Ireland--from folk clubs such as the legendary Passim in Cambridge to benefits for organizations such as Milwaukee Habitat for Humanity, festivals such as Boston's First Night and the Lawrence, MA Bread and Roses Labor Festival to hundreds of churches, colleges, schools and libraries. Pete Seeger has said, "I admire the work of Ben Tousley tremendously," and I'm sure you will too. We are asking a $10 admission and if you can, please bring a dessert. We will gather at 7:30, and the music will begin at 8:00. (There may be some very special guests opening for Ben!) There will be two sets with an intermission. Those of you who came to my last house concert know how enjoyable it was. I can assure you that Ben will be equally delightful. Some of you may have heard him in previous trips to this area, so you already know what a fine musician and songwriter he is. I would appreciate it if you could get back to me as soon as possible if you plan to attend, so I will know how many to plan for. You can reply to this email or call me at 452-4013. I hope to see you there! Many of our fellow American citizens, although believing deeply in the cause of peace, and wanting an end to the occupation in Iraq, sincerely question the effectiveness of non violent direct actions, protests, marches, etc. Perhaps we all do at times. There are obviously some people who are offended by (the often) stridency of the message while others are inspired by it. We, (speaking of the Peace Movement in general) keep looking for more effective ways to change the direction the country and world seems to be heading or at least to ease the immense suffering. Millions have come out to march in protest, tens of thousands have been arrested for civil disobedience, many have been arrested multiple times, and it hasn't stopped the war yet. (Speaking only for myself, I don't know the best or maybe even a good way to oppose war and oppression, but I do know what is worst and for me that would be to do nothing, to be silent.) That's just me and I realize what's right for me is not necessarily right for anyone else. That said, to explore this further, a short documentary is being put together with citizens sympathetic to the Peace Movement, but who are not necessarily directly involved. We hear often, the phrase, "Where is the outrage?" However, many have excellent, well thought out, even spiritual reasons to remain, so to speak, somewhat on the sidelines. These voices need to be heard. The apparent silence of a large portion (majority) of the American public needs to be understood if it is ever to be addressed effectively . This film will explore (not challenge or blame) those reasons and also, what if anything, from your standpoint, it would take to get a larger segment of the public to take direct action, to become actively involved. Your thoughts are of great interest and importance. You can be anonymous if you like, even interviewed off camera if you like. Please feel free to pass this on. From Peigi Mulligan - A great site by Glenn Weiser. A lot of good resources for Irish guitar and harmonica.